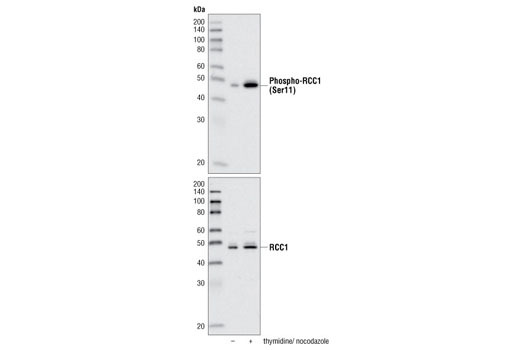 Western blot analysis of extracts from HT-29 cells, untreated or synchronized in mitosis by thymidine block and released into nocodazole, using Phospho-RCC1 (Ser11) Antibody (upper) or RCC1 Antibody #3589 (lower). Phospho-RCC1 (Ser11) Antibody recognizes endogenous levels of RCC1 protein only when phosphorylated at Ser11. Polyclonal antibodies are produced by immunizing animals with a synthetic phosphopeptide corresponding to residues surrounding Ser11 of human RCC1 protein. Antibodies are purified by protein A and peptide affinity chromatography. The Ras family small GTPase Ran is involved in nuclear envelope formation, assembly of the mitotic spindle, and nuclear transport (1,2). Like other small GTPases, Ran is active in its GTP-bound form and inactive in its GDP-bound form. Nuclear RanGTP concentration is maintained through nuclear localization of guanine nucleotide exchange factor (GEF) activity, which catalyzes the exchange of bound GDP for GTP. Regulator of chromatin condensation 1 (RCC1) is the only known RanGEF (3). RCC1 is dynamically chromatin-bound throughout the cell cycle, and this localization is required for mitosis to proceed normally (4,5). Appropriate association of RCC1 with chromatin is regulated through amino-terminal phosphorylation (5,6) and methylation (7). RCC1 regulation of RanGTP levels in response to histone modifications regulates nuclear import during apoptosis (8). In mitosis RCC1 is phosphorylated at Ser11, possibly by cyclin B/cdc2 (9-11). This phosphorylation may play a role in RCC1 interaction with chromatin and RCC1 RanGEF activity (6). Quimby, B.B. and Dasso, M. (2003) Curr Opin Cell Biol 15, 338-44. Hetzer, M. et al. (2002) Nat Cell Biol 4, E177-84. Moore, W. et al. (2002) Curr Biol 12, 1442-7. Ohtsubo, M. et al. (1989) J Cell Biol 109, 1389-97. Li, H.Y. and Zheng, Y. (2004) Genes Dev 18, 512-27. Hutchins, J.R. et al. (2004) Curr Biol 14, 1099-104. Chen, T. et al. (2007) Nat Cell Biol 9, 596-603. Wong, C.H. et al. (2009) Nat Cell Biol 11, 36-45. Horiike, Y. et al. (2009) Mol Biol Rep 36, 717-23. Hood, F.E. and Clarke, P.R. (2007) J Cell Sci 120, 3436-45.